Looking for an escape from the city? Head a little way south to this former industrial precinct from the 1920s. 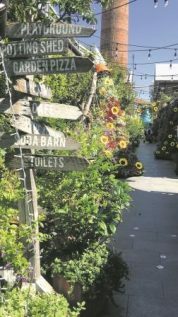 Within the original brick walls, The Grounds offers restaurant and bars, a bakery and patisserie, coffee roasters, an animal farm, a florist, markets and more in a cosy garden atmosphere. You can shop for quality artisan products and healthy groceries, then relax and enjoy a delicious cocktail at Potter’s Shed while watching Fluffy the parrot perform his dance moves, all within this cloistered urban retreat.